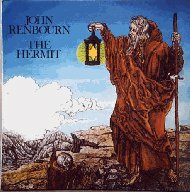 Renbourn's first post-Pentangle (or nearly post-Pentangle) solo album, joined briefly by fellow guitarist Dominique Trepeau and featuring further contributions by John James, is one of his most beautiful recordings, and also among his most spare guitar instrumentals. Some of the material is drawn from lute and harp sources, and it is ear-opening to hear some of the more familiar pieces among the latter (such as "O'Carolan's Concerto") transcribed for guitar, but Renbourn isn't above adapting themes from television commercials, either. The mood of much - though not all - of this record is one of serious introspection, as Renbourn stays generally within a classical guitar mode. He has fun with the material, and the CD booklet also includes musical transcriptions of some of the tunes on the record, for the benefit of Renbourn's fellow guitarists. Turlough O'Carolan, the blind harpist and poet, occupies a unique position in the history of Irish music. He is thought of as being the last of the Irish Bards and during his lifetime he was held in high regard for the quality of his compositions and also feared for the sharpness of his tongue. He was renowned for his love of good whisky which is the theme and inspiration of a number of his finest works. After his death, brought about by a period of enforced abstinence, his skull is said to have been preserved by the country people and used as a drinking vessel for a cure for epilepsy. This is a short tune in E minor which is an extension of a 45 second background piece commissioned by the makers of some famous fruit pies. the construction is genuine Mock Tudor. A little tune respectfully dedicated to the young daughter of a prominent guitarist. This is played in a tuning commonly used by guitarists for vihuela and lute music.